Long Beach Playhouse presents Tom Stoppard's THE REAL THING. Tom Stoppard, author of Shakespeare in Love and several other well-regarded contemporary works, takes aim at truth, fiction, romantic illusions and the realities of relationships in his play The Real Thing. First produced in 1982, the play draws on pop culture allusions and other plays and playwrights in its quest to examine marriage, fidelity and infidelity. "Stoppard is masterful in the way he constructs side-by-side analyses of the real life marriage of a playwright and his wife using a play within a play to disclose the truths and the fictions of their relationship," said Andrew Vonderschmitt, Executive and Artistic Director for the Playhouse. Sean Gray is at the helm as the director for the Playhouse production of The Real Thing. Gray, who is ordinarily behind the scenes, literally, as the theatre's Technical Director, has taken the reins for several Playhouse productions. And always to the great delight of the audience and the media. Reviews in publications such as the Long Beach Post, Press-Telegram and Inland Valley Daily Bulletin, have called Gray's directorial work fearless, artful and delightful. "Sean is one of the best directors I've ever worked with," said Vonderschmitt. "His ability to help actors find the truth, humanity and nuance in their performances is impressive. I know the audiences will find plenty to enjoy in this production. It is funny, touching and honest - it lets all of us think about the ways we tell the truth and the ways we hide it." Adults are $24.00, seniors $21.00, and Students $14.00. Tickets are available at www.lbplayhouse.org, or by calling 562-494-1014, option 1. 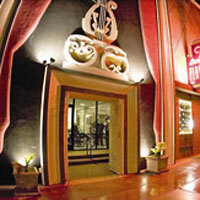 Long Beach Playhouse is located at 5021 E. Anaheim St., Long Beach, CA, 90804, right across from the Long Beach Recreation golf course. The Playhouse is community-supported theatre with programs and events that cut across age, gender, ethnic, and cultural boundaries. Performances are 8 p.m. Friday, and Saturday and 2 p.m. Sunday. The box office is open Wednesday-Saturday from 3:00-8:00 pm and Sundays from 1:00-2:00 pm on scheduled matinees.